New models of plants, like cars, are deemed necessary to keep consumers interested and spending money. My cars (actually trucks . . . you know, manure and all that) stay with me for as long as they keep rolling along, so it was with equal skepticism I looked upon a new “model” of mandevilla, called Crimson, that arrived at my doorstep early last summer. I was first attracted and introduced to mandevilla about 20 years ago. The glossy leaves and the bright red, funnel shaped flowers, were part of the attraction. The vining habit was also a big part of the draw, making the plant a stand-in for morning glory, but with prettier leaves and brighter flowers. Mandevilla is a perennial, tropical vine, so must winter indoors rather than be seeded outdoors each spring like morning glory. My vine’s leaves yellowed so much in winter that I tired of looking at it; one winter day I walked it over to the compost pile. The variety Crimson is a new kind of mandevilla whose main selling point is its bushy growth habit. So yes, it is different and new, but wasn’t that vining habit one of the things I always liked about mandevilla? Still, I have grown very fond of Crimson. It flowered continuously all summer and, since coming indoors in September, continues to do so, with new buds on the way (at every third leaf bud, according to the “manufacturer.”) I’m going to think of Crimson mandevilla as a very pretty, long blooming, bushy plant. Yes, it’s a worthy new model. 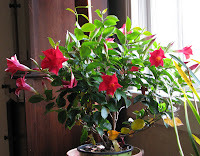 Sickly-looking leaves of houseplants – such as my mandevilla of yore – can be traced to a number of causes. Already I’m seeing this yellow transformation creeping up on my gardenia, which just finished one of its hopefully many fragrant shows. Both mandevilla and gardenia need soils that are quite acidic (pH 4-5.5) in order to thrive. Not enough acidity makes it hard for the plant to imbibe iron, resulting in iron deficiency and yellow leaves. But wait! It’s not time yet for the “iron pills.” Looking more closely at my gardenia, I see that it is the oldest leaves that are yellowing. Hunger for iron causes the youngest leaves to yellow (and for their veins to remain green). Yellowing of older leaves most commonly means that the plant isn’t getting enough nitrogen. The nitrogen is being robbed from older leaves (which turn yellow because nitrogen is an important component of green chlorophyll) to feed the younger leaves. The prescription? Add some soluble nitrogen fertilizer and pay more attention to watering. Too much water drives air out of the soil, and roots gasping for air have trouble doing their work to take up sufficient nutrients. Yellowing leaves are not always a bad thing. (Think of birch leaves a few weeks ago, or aspen leaves.) I’m happy that my asparagus’ leaves have yellowed. The plants have been growing vigorously all season, feeding their roots to fuel next year’s growth of the delicious young spears that I’ll be snapping off at ground level from late April to early July. With this year’s work finished, the shoots and leaves, left to grow unfettered since early July, are yellowing and dying back. My short-bladed brush scythe was the perfect tool to make quick work of the plants, a fluffy addition to the compost pile. With the asparagus shoots and leaves cleared away, I could get into that bed and weed it. The bed was pretty much weed-free until July, but then wet summer weather kept weeds germinating and growing, and hard to reach among the 6-foot-high forest of feathery stalks. The bed is now weeded and soon to be fertilized (2#/100 square feet of soybean meal) and mulched (wood chips 2 inches deep). I don’t know about you all, but I have a great urge to tidy up my garden this time of year. Partly it’s because doing so leaves one less thing to do in spring and partly because, as Charles Dudley Warner wrote in My Summer in the Garden in 1889, “the closing scenes need not be funereal.” All this tidying up is usually quite enjoyable. Moist soil – and not too, too many weeds – make weeding fun. 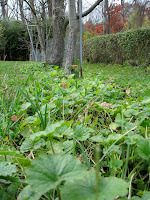 Creeping Charlie (also know as gill-over-the-ground) has sneaked into some flower beds. Its creeping stems are not yet well-rooted so one tug with a gloved hand and a bunch of escaping stems slithers back from its travels forward from beneath and among flower plants and shrubs. What remains are occasional tufts of grassy plants, especially crabgrass, easily wrenched out of the ground or coaxed out with my Hori-Hori garden knife. This tidying is intimate work: me, the soil, weeds, and garden plants at close range. While I’m down there on hands and knees, I’ll also cut back some old stalks of perennial flowers. When everything is cleaned up, I’m going to spread a blanket of chipped wood (free, a “waste” product from arborists) over all bare ground. 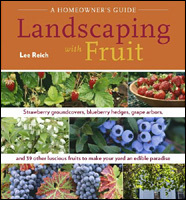 The one thing not to do this time of year, as far as tidying up, is pruning. Better to prune after the coldest part of winter is over and closer to when plants can close up wounds. 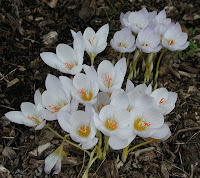 A few weeks ago, I, along with anyone visiting my garden, was wowed by autumn crocuses then in bloom. As I pointed out, they weren’t not true crocuses (they were Colchicum species), they just ed like crocuses – on steroids. Today, October 27th, I noticed that my true autumn crocuses (that is, the ones that are Crocus species) are in bloom. And I did really have to stop and notice them after that most flamboyant show of fake autumn crocuses. These true crocuses (crocii?) are dainty plants, just like spring crocuses, and their colors are subdued: some are pale violet and some are white. In contrast to the fake autumn crocuses, which multiplied like gangbusters, the real autumn crocuses look about dense as when I planted them. Both kinds of crocuses wait until spring to show their leaves. It’s fortunate that the part of my garden, which is the mulched area beneath the dwarf apple trees, that’s home to autumn crocuses, real and fake, is free of weeds. Otherwise, the real autumn crocuses, being so dainty and lacking a supporting role of leaves, would be swallowed up, visually or for real. Back to weeds . . . I’m trying to see the positive side of all that creeping Charlie I’ve been pulling. Bits of it that have insinuated themselves in amongst the bases of stems of woody shrubs, especially thorny ones like the Frau Dagmar Hastrup rose, are not that much fun to weed out. So what’s good about creeping Charlie? For one thing, with shiny, round leaves of a deep, forest green color, it’s not a bad looking weed. The flowers are an attractive, purple color although neither big nor prominent enough to make a statement. The otherwise excellent reference book Weeds of the Northeast (Cornell University Press) erroneously states that “the foliage emits a strong mint-like odor when bruised.” That would be nice except that I’ve never noticed that odor and didn’t even when I just ran outside to crush some leaves check up on this statement. Creeping Charlie grows well in sun or shade, so well that when I worked in agricultural research for Cornell University, I considered the plant as a possible groundcover to replace the relatively sterile herbicide strips in apple orchards. It grows as such beneath my dwarf pear trees. The plant could even be a somewhat ornamental groundcover, making up for any lack of great beauty with its capability to rapid fill in an area and grow only a couple of inches high. You couldn’t ask much more from a plant – except to keep out of some of my flower beds. Dateline: New Paltz, NY, October 19th, 5:30 am. I bet my garden is colder than your garden. 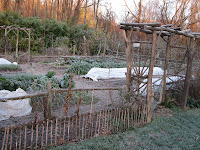 I was startled this morning to see the thermometer reading 23 degrees F. Not much I could do at that point about protecting “cold weather” vegetables still in the garden, some covered with floating row covers and some in “plein aire.” The thing to do under these circumstances was wait for the sun to slowly warm everything up and then assess the damage. I ventured out to the garden for a survey in the sunny midafternoon. Joy of joys. None of the cold-hardy vegetables was damaged by the cold. Romaine lettuces stood upright and crisp, arugula was dark green and tender, radishes were unfazed, and the bed of endive, escarole, and radicchio looked ready to face whatever cold the weeks ahead might offer. That 23 degree temperature reading came from my digital thermometer read indoors from a remote sensor out in the garden. Most surprising was the reading from the old-fashioned minimum/maximum registering mercury thermometer out in the garden. This thermometer remembered the night’s lowest temperature as 20 degrees F. Brrrrrrrr. 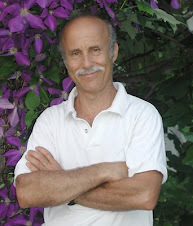 Moving, figuratively, to warmer climes: the Mediterranean. I’m taking the Mediterranean diet one step further by trying to grow some of the delectable woody plants of that that region. Figs are a big success, and not an unfamiliar sight well beyond their natural range. I’ve tried all the usual methods of growing them in cold climates. I’ve grown them in pots brought indoors for winter; I’ve bent over and covered or buried the stems to protect them from cold; I’ve swaddled the upright stems in leaves, straw, wood shavings, or other insulating materials. All yielded some fruit, but none of these methods beats having a small greenhouse with the trees planted right in the ground. Handfuls of soft figs, so ripe that each has a little drip from its “eye,” follow each sunny day and should do so for a few more weeks. Bay (as in “bay leaf”) also does well, this one potted. After 20 years, my bay laurel is a handsome little tree, trained to a ball of leaves atop a single, four-foot trunk. The fresh leaves are much more flavorful, almost oily, than dried leaves, especially the old, dried leaves typically offered for sale. Three hopeful Mediterranean transplants are my olive, feijoa, and lemons. I purchased the olive tree in spring, whereupon it flowered and has actually set a single fruit! The feijoa, also known as pineapple guava, has two fruits on it, which might not seem like a big thing except that those two fruits represent the culmination of about 15 years of effort. (More on that some other time.) True, feijoa is native to South America, but it thrives and is often planted in Mediterranean climates. The same goes for lemon, except that it is native to Asia. My Meyer lemon hybrid, like the olive, was potted up this past spring and sports a single fruit. The long shots among my Mediterreans are pomegranates. My two plants – the varieties Kazake and Salavastki – are cold-hardy, early ripening, sweet varieties from central Asia, so should do well here in a pot. (They are cold-hardy for pomegranates, down to a few degrees below zero degrees F.) They have yet to flower and fruit. In a few weeks I’ll move all the potted fruits to the sunny window in my very cool basement, where winter weather is very Mediterranean-esque. Persimmon is another tree grown in Mediterranean countries, although it’s not native there. 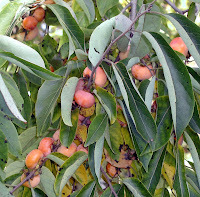 Up here, I grow American persimmon, an outdoor tree that is cold hardy to below minus 20 degrees F.. Besides yielding delectable fruits, it’s a tree that requires almost no care, not even pruning. Some of the tree’s branches are deciduous, naturally dropping in autumn. Heavy winds of a few weeks ago took the persimmon’s self-pruning theme too far and blew the top off my 20 year old tree. Fortunately, my three other persimmon trees remained unscathed. I’ll just trim the break from the decapitated tree and it will be fine. That dead wood need not go to waste; it’s used to make high quality golf clubs. Not for me; I couldn’t get out of the garden long enough.